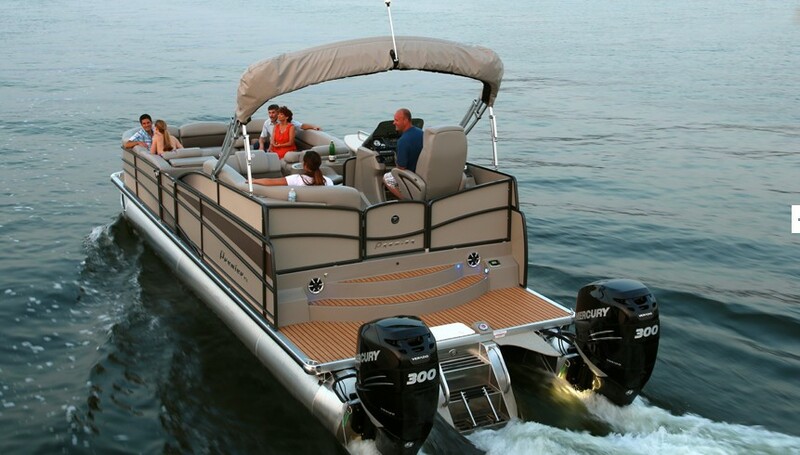 Quality, performance and some clever design ideas come together in this mondo condo of a pontoon boat. 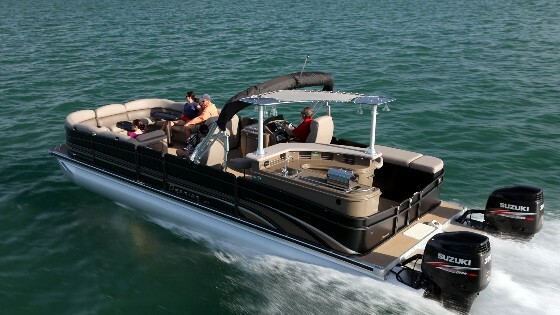 The Premier 290 Grand Entertainer is a show-stopper of a pontoon boat. My first encounter with this wide-beam pontoon was at the Miami boat show, where it was moored right on the bulkhead at the in-water display area—and it stopped people in their tracks. Maybe it was the full bar in the boat’s aft corner. Perhaps it was the pair of 300-hp Suzuki motors on the transom, or the shade offered by its expansive canvas top. But people who probably were there to see a new offshore fishing boat or go-fast runabout were intrigued and asked to come aboard, and most didn’t blink when told the retail price was just over $138,000. Go big or stay home. Twin Suzuki 300 outboards will push the Premier 290 Grand Entertainer to 51 mph. According to Premier president Bob Menne, a veteran of the boat-building business, high-end pontoon boats like those built by Minnesota-based Premier are doing well in a down economy, and are taking sales away from the fiberglass market. And there’s a lot to love. 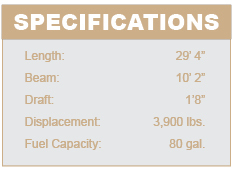 Overall length is 29 feet 4 inches, and the deck measures 29 by 10 feet. I once had an apartment in New York with less floor space. A Grand Entertainer model in this length with the wide beam was not in the Premier catalog last year; it was sort of a special-order build to see if there would be demand. Apparently dealers sold a lot of them, so it goes in the book and on the website for 2013. There’s also a 290 Grand Entertainer model with an eight foot six inch beam, but that can only be rigged with a single engine. Go for the wide beam and you can order up to twin 300-hp motors, although Menne told me that twin 250s is the most-popular power option. And Premier will rig this boat with any brand of outboard. The wide-beam version of the Premier Grand Entertainer combines elbow room with living room comfort – if you have a bar in your living room. 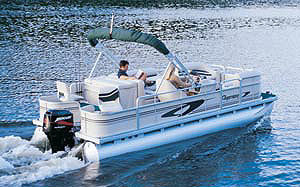 This model rides on a the Premier PTX running surface, with 27-inch diameter round outboard tubes and a 36-inch-wide center hull section with a curved running surface and flat pad area on the bottom. The outboard tubes have lifting strakes on the inboard sides only. The tubes are tied together with aluminum Z-channel cross members on 16-inch centers. The deck is seven-ply treated plywood. The result is a hull system that produces a lot of buoyancy and stability. At speed the boat planes on the center section, and then heels into turns. There’s very little of the “skidding” sensation you can feel when turning some pontoons at speed. 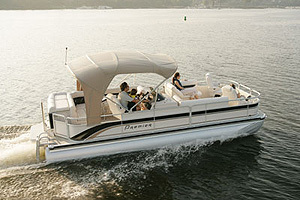 This big Premier handles very well for its size, but it needs to be agile with this much power on the transom. 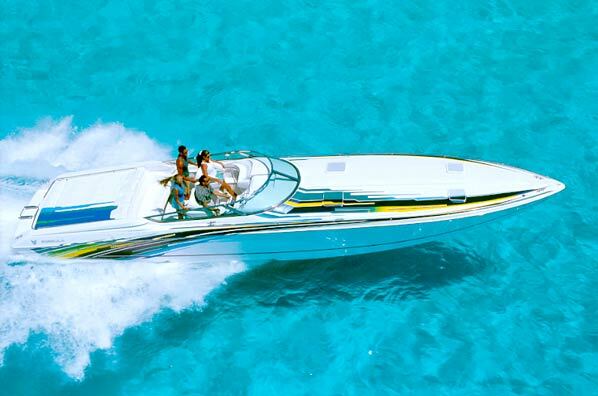 The boat with twin Suzuki DF300 motors will run over 51 mph, and cruise along at 30 mph at 3500 rpm. 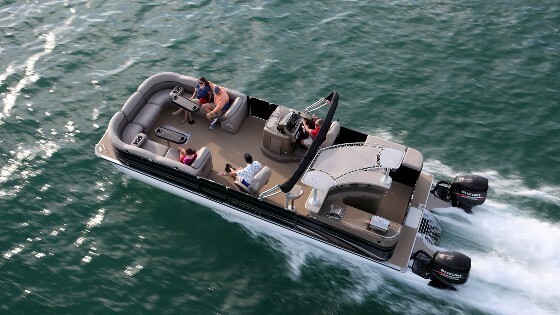 You can also get the wide-beam 290 with a single outboard, but that eliminates one of the key features of the twin-motor configuration, a three-level boarding step that’s built right into the aft end of the center tube. 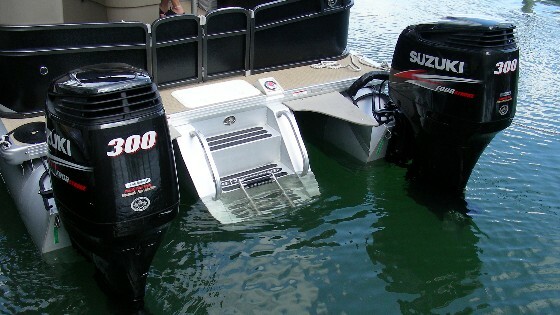 It incorporates a grab handle, a light, and has an additional three-step ladder that flips down into the water. The twin-engine layout leaves room for this boarding step, perfect for making a graceful entrance after a swim. The aft bar area is also standard equipment on this model. It’s a little over the top for my taste, but if you do a lot of dock-side entertaining it will be a popular gathering spot. The bar takes up about the aft third of the deck area, and is based on a molded fiberglass console that aligns with the port deck edge and then hooks around to the middle. Outboard there’s a stainless steel grill and sink, a refrigerator, and stainless steel drawers, plus counter space. Inboard is an elevated bar top plus four fixed stools. The bar is even equipped with a foot rail and purse hooks. A hardtop with laced canvas insert provides some shade, and incorporates an overhead rack for inverted stemware. I kid you not. 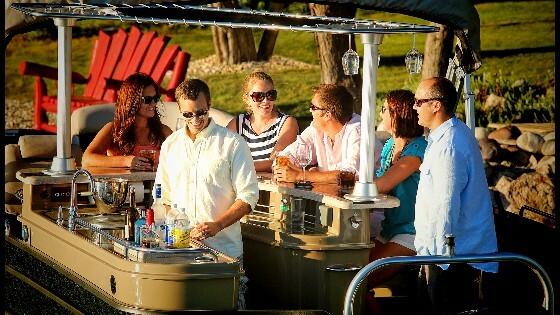 Move from the helm to this full-service bar area, and you become the grand entertainer. The front third of the boat is filled with wrap-around seating, as comfortable as a home sofa because it’s manufactured by Flexsteel. You can see the steel springs under the cushions when you flip them open to reach stowage below. Each is secured with an EZ Hinge system that allows the cushion to rotate forward and then down, so it’s easy to reach over and won’t fall. There are some nice construction details to see here – the hinge mechanism is finished in durable powdercoat, and the base structure is rot-proof roto-molded plastic. The center seat section in the bow is not attached to the deck, so it can be moved to access the front gate, when the boat is beached, for example. It’s sized to slide into place in front of either of the side gates. 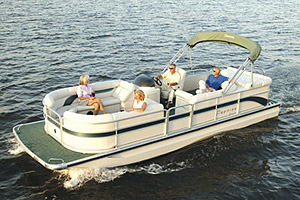 This boat comes with two cocktail tables and a pair of armrests with drink holders that can be moved around the seating area. In the center of the deck is a ventilated plastic hatch over a seven-foot-long molded-plastic ski locker, which fits within that giant center hull section. There’s enough canvas to cover the entire seating area. The helm is an elevated fiberglass console that offers a great view forward, important if you have a lot of company on board. New on the helm for 2013 (but not on the boat I ran) is a Beacon System touch screen display that incorporates instruments, accessory and system controls, engine diagnostics, and will even be loaded with the owner’s manual. The screen controls an audio system with four speakers and a ten inch sub-woofer. It can also be rigged with an optional rear-view camera. The dash still has a complete set of traditional instruments, because touch screen technology may be too “new-fangled” for some owners, I guess. The one option that everyone asked about in Miami was the Sea Glass deck covering. Manufactured in the Netherlands, I was told by Premier, it’s a fabric of woven extruded vinyl, laminated to a rubber membrane (not simply an embossed vinyl, as I’ve seen on other boats). It’s indestructible, stays cool in the sun, and feels soft underfoot. It also costs $4,185. Everywhere I looked, from the rich feel of the NBT vinyl upholstery to details like the hammered finish on the rails, there’s evidence of real quality and attention to detail on this boat. 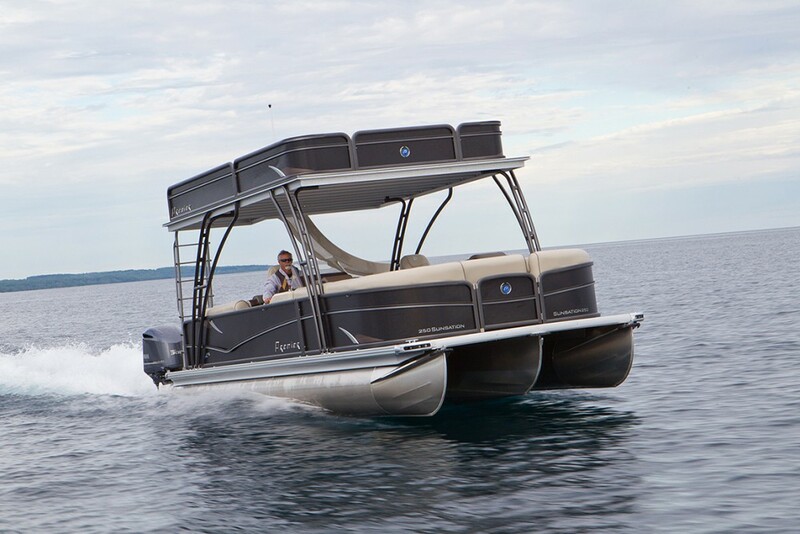 If you never, ever thought you’d consider a pontoon boat, the Premier Grand entertainer might change your mind. For more information, visit Premier Marine.